Just the sight of those awful furniture sale adverts that seem to have plagued our TV screens for years is enough to have most of us reaching for the remote. The thought of actually going out and making a purchase can be enough to make the most laid back individuals break into a sweat; misleading so-called sale items, pushy sales people and crowded stores can all contribute to this. Before you even step out the door, you need to decide what it is you are looking for. Just knowing you need a sofa to go in your main living area isn’t enough, you need to whittle it down to the fine details. What colour are you after? Neutral colours for major pieces are recommended as they tend not to go out of fashion. What is your price range? Decide what you can realistically afford but remember that more often than not, you get what you pay for. Cheap furniture tends not to last as long, but if it’s a bed for a spare room, perhaps that doesn’t matter. Make sure you weigh up all the pros and cons. Where are you going to buy from? If you have seen a specific item you are after, at a good price, perhaps go online to make sure it really is a good deal. Read reviews from previous buyers, this information can be invaluable when buying. There’s a good chance you can make an online purchase and use your time for something more enjoyable. The Office of Fair Trading (OFT) recently cracked down on a number of retailers who were offering customers what they call a ‘fake sale’. This is where retailers advertise the item with a hugely knocked down price, so that the buyer thinks they are getting a great deal. More often than not (95% of the time according to a recent survey), the product has never been for sale at that price to begin with, making it nothing more than a Del Boy style marketing scam. A number of big retailers were penalised as a result of using this trick. Closing down sales may be tempting, but there could be a good reason for it too, like they were selling cheap rubbish for example. Also bear in mind you may not have a leg to stand on should the piece turn out to be faulty. 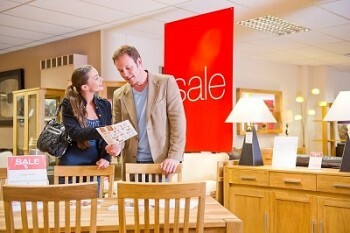 Clearance sales tend to be better, as the store is simply making room for next season’s stock. You can often get huge discounts on show pieces, just make sure that it is in good condition, or that any imperfections are things you can live with. Don’t rule out buying second hand furniture either; there are some fantastic deals out there online and in thrift stores. You could end up with a really sturdy, long lasting item that costs less than a brand new, cheap alternative with a short shelf life. We usually look for a clearance sale, it is happen during February to March in our place. All the prices marked down and we could definitely save on those items. Great tips! You are so right that it helps to have a good idea of what you are looking for. If ever I go out shopping without knowing that, it takes a TON more time and often more money. Definitely agree with the tip to not rule out second hand furniture. My in-laws are super-frugal and manged to pick up a 2-seater settee and armchair in perfectly good condition on ebay after a winning bid of….drumroll….one pound! What’s even more frugal is that a few years later the missus and I nabbed it from them for free to furnish our first house together! The “mark up the price so we can give a big discount” is a favorite method used by many American companies as well. Kohls (clothing store) is a big user of this. They don’t necessarily mark up the price…their prices are just normally high. Then, when you get a 30% off coupon in the mail you think you’re getting a great deal. I just never shop there at all unless I have the 30% off discount. My wife and I bought all new furniture when we got our apartment, mainly because we only had furniture from when we were younger and in college that was essentially falling apart haha. We got it from a few different stores and avoided any of the high-end furniture. Having high-end furniture just isn’t a priority for us and I’m not sure when it will be, if ever. In my home town, we had a furniture store that was “going out of business” for almost 2 years and having a “going out of business sale”. Nice! I like to negotiate but I have to admit that I’ve never stuck with it for that long, just goes to show you should never give up.